Alliance Française de Singapour is searching for the next big photographic artist. 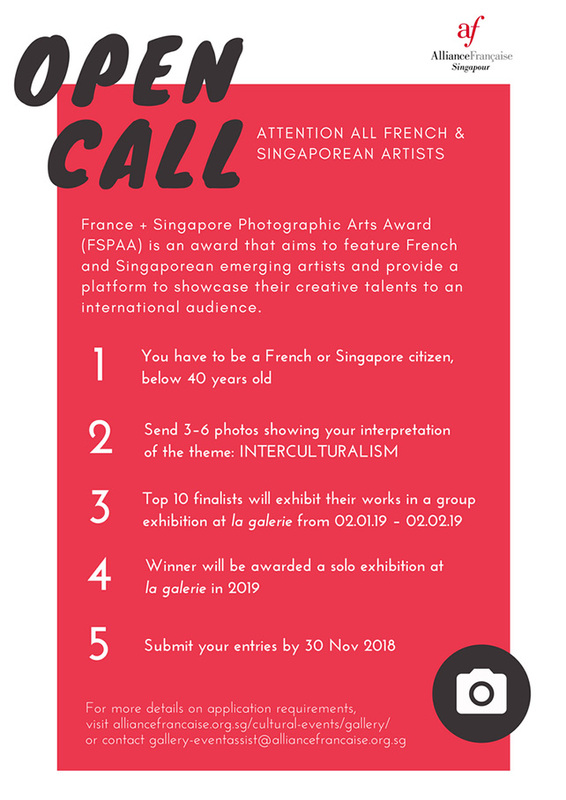 This is an international open call for the 9th France + Singapore Photographic Arts Award (FSPAA), an award that aims to feature French and Singaporean professional artists. Providing a platform to showcase their creative talents to an international audience, this award raises awareness of the experimental and emerging styles of photographic art. It is also organized to promote the exchange of artistic knowledge, experiences, and ideas between the artists from France and Singapore. Applicants are required to propose 3 to 6 photographs. A judging panel consisting of 3 professionals from the creative industry will select 10 finalists from the open call proposals. If you are selected to be one of the top 10 finalists, 3 of your artworks will be exhibited at the finalist group exhibition held at la galerie from 2nd January 2019 to 2nd February 2019. The WINNER of the competition will be announced on the opening night of finalist group exhibition. The GRAND PRIZE for the WINNER is a SOLO EXHIBITION at la galerie in 2019. THE CRITERIA: You have to be a French or Singaporean citizen (including PR) to be eligible. – Below 40 years old. – The artworks need to be relevant to the theme of the competition (the relevance should be explained in the artist statement) – The complete proposal (with all the necessary contents included) needs to be submitted before the DEADLINE: 30 November 2018.